You have to make you own RIPPL**.raw files and place them above startup.pod in pod.ini. Or make fake water, either using models (like dkridergz do when he makes waterfalls, or like that pool in Alphaville.) or animated textures like in King of the Hill. There's a "Water" texture type in Traxx. Lay a muddy texture down, and in the properties box choose it. It won't use the ripple effect when you drive into it, but it will slow you down. Ah, I had fun in Evo with that. 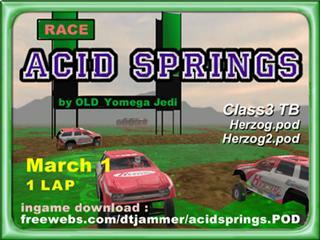 (Acid springs, anyone?) Green water. Lol. what I did was extract the stock water files, and then imported them into pain shop pro. Then I colored them just how I wanted them (in snowbound), and podded them back up. if podded in the top of the ini it will give you nice blue water. For the watefralls i used the same textures on the ground, but animated them in same sequence the game did. For mist at the bottom I used an animated flat bin. I made it transparent, I colored the mist grey, and in every frame the mist cloud gets bigger, then repeats. The effect is a small bit of mist spreading at the bottom of the fall, then starting over. if you download snowbound, right near the end of the track you come downhill facing a water fall. Don't forget to do a custom palette for your track in traxx. I could not get the water to turn blue i my last track no matter how hard i tried. it turns out the colors I used were not included in the stock traxx palette. If you extract the original fixit.pod the blue water I made, and the textures are in there named after the stock stuff. You can just extract those and have just few textures to work with rather than trying to find them in the stock tracks. IMHO it is easier to import them and re-color than try and make them from scratch.